Presidential candidates set politics aside for a day of mourning. 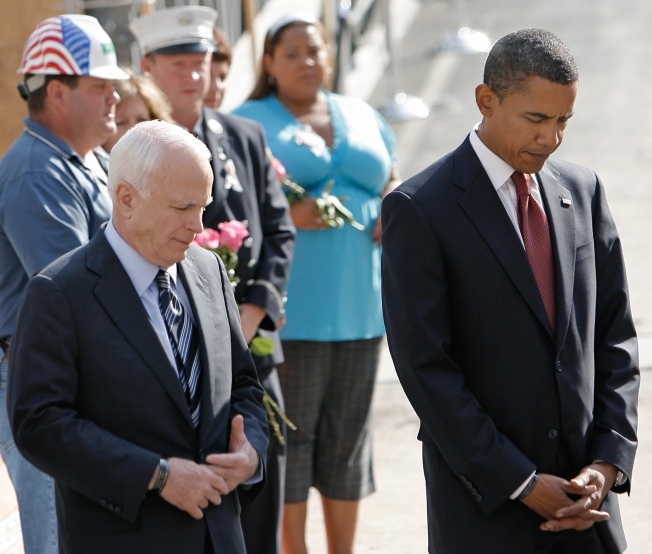 Presidential nominees Sen. Barack Obama and Sen. John McCain take a moment of silence and bipartisanship as they stand by a reflecting pool at Ground Zero. Putting their partisan contest on a respectful hold, they went together into the great pit where the World Trade Center once stood and, as one, honored the dead from the terrorist attacks of Sept. 11, 2001. They walked down a long ramp flanked with the flags of countries, chatting at times, silent other times, and sharing a quick laugh at one point. Right behind them, Cindy McCain clutched Mayor Michael Bloomberg's arm — Michelle Obama was with her daughters in Chicago. At the bottom of the ramp, the two rivals stopped to talk with a small group of family members of the attacks' victims of seven years ago. They laid flowers at the pit's commemorative reflecting pool — a pink rose from Obama, a yellow rose from McCain — bowed their heads and walked off to speak with fire and police personnel. There were no speeches. Earlier, McCain spoke briefly at a simple ceremony in remote, rural western Pennsylvania, held on a large hilly field close to where United Airlines Flight 93, the third of four airliners commandeered by terrorists, crashed. Investigators believe some of the 40 passengers and crew rushed the cockpit and thwarted terrorists' plans to use that plane as a weapon like the ones that hit the World Trade Center and Pentagon. All aboard all planes died. The Arizona senator said those on the flight might have saved his own life, as some believe the terrorists wanted to slam that plane into the U.S. Capitol. He said the only way to thank those who died on the flight is to "be as good an American as they were." "We might fall well short of their standard, but there's honor in the effort," McCain said. Obama, in a statement, said that on Sept. 11, 2001, "Americans across our great country came together to stand with the families of the victims, to donate blood, to give to charity, and to say a prayer for our country. Let us renew that." The Illinois senator added: "Let us remember that the terrorists responsible for 9/11 are still at large, and must be brought to justice." Left unstated by both was their sharp disagreement over the Iraq war, which McCain supported and Obama opposed as a distraction from the Afghanistan war and broader fight against terrorism. It was not a day for spelling out differences but rather a respectful time out in a campaign with 54 days to go. Both agreed to suspend TV ads critical of each other. In Pennsylvania, grieving family members and a few dignitaries sat in front of a chain-link fence adorned with flags and mementos that serves as a temporary memorial while a permanent one is built. Bells were rung as the name of each victim was read. McCain and others laid wreaths at the foot of two flagpoles and a large wooden cross. The political truce was evident in remarks thanking McCain for traveling to Shanksville by Pennsylvania Gov. Ed Rendell, a Democrat who occasionally speaks against the Republican nominee as an Obama campaign surrogate. "It's an honor to have him here, not just as a presidential candidate but as a great American patriot," Rendell said. Obama and McCain were intersecting again later, at a Columbia University forum on public service in the evening. Their sessions at the forum were separate. At the Twin Towers site, Bloomberg told them time was running out to touch the bedrock at the base of the pit. "This is the last year because the ramp goes away for the rebuilding," he said. Officials said the family members Obama and McCain talked with were Mary Fetchet, whose son Brad worked on the 89th floor of the South Tower; Michael Henry, brother of fireman Joseph Henry; Joanne Langone, widow of policeman Tom Langone; and Maggie Lemagne, sister of Port Authority officer David Lemagne. Brian Cichetti, a World Trade Center site safety manager who is working on construction of the memorial and museum, also was with them. At the top of the ramp on the way out, McCain and Obama shook hands with police officers. "Appreciate everything you do," Obama said. "God bless you all. We think about you this day and every day." The memorial at the World Trade Center was also attended by New York Mayor Michael Bloomberg, and Gov. David Paterson. Around the world, 200 concerts were being held to mark 9/11 as a day to "celebrate the universal humanity" we all share. Britain's Prime Minister Gordon Brown called President Bush to pledge the continuing support of the British people for America, before attending the concert in London's Grosvenor Square. Obama's running mate, Joe Biden, visited an American Legion post in suburban Cleveland for an invitation-only gathering of area police, firefighters and other first responders. "Part of today is reminding Americans that every single day there are acts that are both ordinary and profound," Biden said in recalling the attacks. "You suit up, head out on that vehicle not knowing what you're going to find. If, God forbid, anything remotely close to that happens, it's going to be you guys trying to save all of us." The Republican vice presidential candidate, Sarah Palin, was in her home state of Alaska to attend an Army ceremony to send her eldest son, Track, off to duty in Iraq.